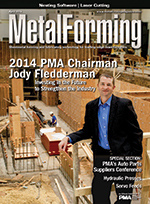 PMA Chairman for 2014 Jody Fledderman, president and CEO of Batesville Tool & Die, puts his money on servo-press technology, 3D printing and other leading-edge technology to stay ahead of demand for automotive stampings. And, hes investing in resources to attract the next-generation workforce to his company, and to the industry. Stamping airbag housings by the thousands has deep-draw specialist Metal Flow Corp. changing servo-press ram speed seven times per stroke, while "bulletproof" rack-and-pinion-driven servo feeds perform tireless work. Design engineers can be the lifeblood of any full-service contract manufacturer, supporting customers that lack engineering capacity. Make the most of engineers' precious time by giving them the software they need to be at their best. Here's a shop that does just that. ...thanks in part to a rotary index station located on one of three shuttle pallets, allowing Jay Manufacturing to bring inhouse previously outsourced tube and structural work. Laser cutting replaces sawing, drilling and machining, allowing Jay to improve quality and reduce costs. Hydraulic Presses: Custom New vs. Used--Which is Best for Your Business? Is it better to fit a new hydraulic press into your operation, or fit your operation into an existing press? Metalformers should explore all options before making this critical decision, as the chosen solution can have a lasting effect on the bottom line. Clothes, Personal Protective Equipment or Special Gear?